Editorial Note: This is the second of a two-part series. 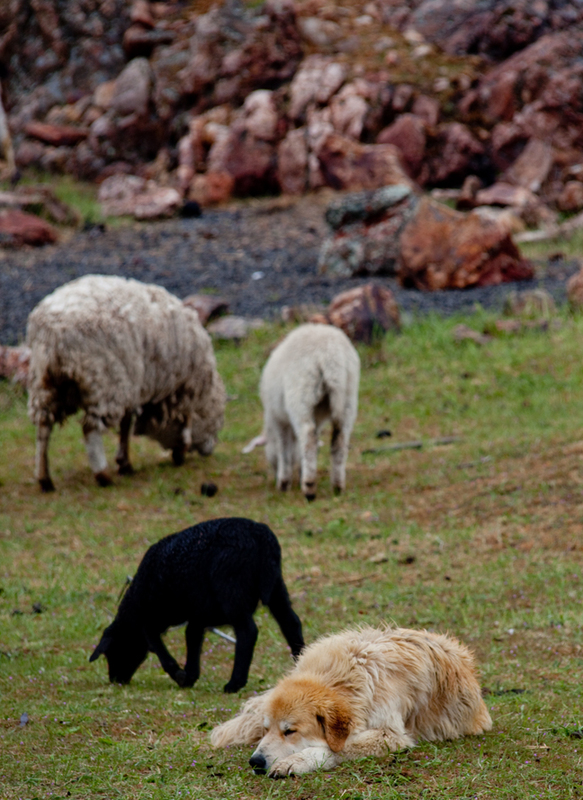 In the first part, livestock guard dogs, Clover and Crimson, arrive to help on a sheep and goat ranch beset by predators. But the dogs have had a traumatic past. Early the next morning, Clover was dead. We checked with her anxious sister, Crimson, for permission to touch the dog’s body. Clover had been killed by an old coyote snare. Somehow, the huge dog had dived through a tiny opening meant for a 25-pound coyote and become snared around her lower chest and upper abdomen. As she struggled to break the trap and return to the flock, the cable tightened slowly crushing her heart. Stunned, nauseous and shocked, my wife and I realized that each time she crawled to get away from us, she was further tightening her noose snuffing out her life before our eyes. We also understood that had we been allowed a simple, brief touch, wire cutters might have saved the day. 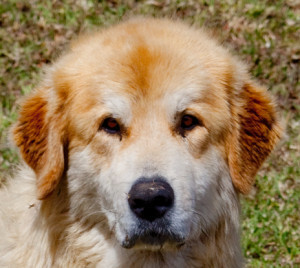 My wife and I had confronted the harsh realities of an untouchable and injured livestock guard dog. Our ranch was a very quiet place for a few days. Slowly, surely, Crimson took up her sister’s slack with our flock. She did an excellent job. If one of our animals was in trouble, she’d wait nearby for us to handle the matter. During lambing and kidding, she’d point out, in her own language, a new member of our flock. In all ways, she appeared happy. Still, she never allowed herself to be touched. Our veterinarian suggested we try a canine tranquilizer. The plan was to slip some into the dog’s favorite food and, hopefully, she’d relax and we could get our hands on her. Then we’d chain her and, much like a wild animal, work slowly on building our bonds of trust. On the big day, Crimson gobbled her hot dogs. Quietly, we waited for the drugs to take effect. At the first sign of a noticeable wobble in her step, we gently walked in her direction. She staggered to the other side of the pen. Quietly, we exited, leaving more hot dogs with a jumped-up dose of tranquilizer. Curious, she investigated the food and consumed it. We waited while she lay down. Once again, we re-entered the pen, complete with submissive body language. She staggered up and weaved to the far side of the pen, watching us. We coaxed and called with more hot dogs. Still wary, she moved further away. We decided to try another dose, a delicate matter when too much would stop her heart and breathing. This time we waited until she appeared sound asleep. All was well, until we got within ten feet. Once again, adrenalin spiking, she struggled to her feet and wobbled off, bouncing off metal sheep feeders. Watching her move out of reach, I debated trying a dash and grab. However, common sense won over when I thought about wrestling any animal that’s taken a triple dose of tranquilizer and might think I was an attacking cougar. It took a few days, but Crimson re-established her bonds, if not her trust, with us. She was an excellent livestock guard dog. The predators were held at bay. When we did lose a creature, it was usually an accident or a freak of weather, like sudden freezing rain. Years later, we bought a young pup for her train by example in the ways of our flock. Once again, she did a good job—with no touching allowed. After Crimson’s successor was fully trained and capable of taking over our flock’s responsibilities, he’d run to greet us every day at feeding time, hoping for a head rub. This year, as we turn out our flock on range, both dogs will guard them from desert predators. But Crimson is getting old. Her rheumy eyes don’t see as well as they did. Her posture is that of an elderly dog and she’s having trouble getting over our fences. Each time they go out the gate, she appears as a happy old dog doing her job. But she goes with a prayer and our hopes for a safe return. If it’s her time to pass, we accept that, even with little or no control over the final fate of our elderly dog. Our hope is her passing to the Great Sheep Pasture in the Sky will be easier than her sister’s. And, just once before she goes, we’d like to hug her big head and feel her tail beating against our legs. For us, that would be perfect.